Sometimes people ask me, "What is your favorite childhood or family recipe?" Two come to mind for me - pot pies (with any kind of meat) and traditional British Yorkshire puddings, which are famous in my home town of Yorkshire, England where my mum made them perfectly every day. 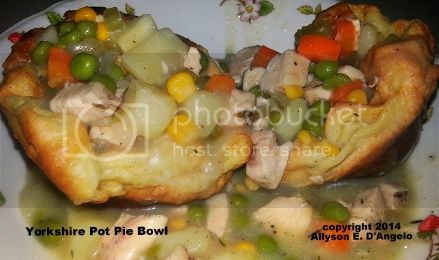 I'm sure most of us have eaten a pot pie at some time, whether it be frozen or homemade. Some frozen pot pies can be quite good, but you certainly can't beat homemade! Yorkshire puddings are a puffy and light quick bread recipe made from a batter of flour, eggs and milk, cooked until golden brown. In this recipe I used 2 percent milk as that’s what my children use for breakfast, but use whatever you like. The heavier the milk the more dense the puddings will be. The lighter the milk, the puffier they will be. Experiment with this and maybe do a half and half batch and see which texture you like the best. Please Note:- The key to making successful Pudds is to have your batter rested and cold before using it – and the fat in the pan should be smoking. It’s very, very important that you don’t peek during cooking or the puddings will not rise. To be organized with this recipe, make your puff pastry croutons (optional) and filling ahead of time (the day before) and then, make your Yorkshire puddings. Place the pastry squares on a greased shallow baking sheet (or one lined with parchment) and bake at 375 degrees F. until golden brown (approximately 10 minutes.) Set aside to cool and store un-refrigerated in a sealed container until ready to garnish. Note: Defrosting the frozen veggies are easy. Just run them under cold water in a strainer until softened. 1. Melt the butter and oil over medium high heat and add the potatoes, onion, celery, carrot, thyme sprigs along with the salt and pepper. Stir and cook for 5 to 7 minutes. Next, add the flour and stir in thoroughly to combine, cooking for 1 minute. 2. Slowly add the broth to the veggies and stir vigorously (fast) so that the flour doesn't form any lumps. Keep stirring and adding broth and then bring the pot to a boil and cook for at least 1 minute. This is so that the flour doesn't taste like paste in your dish! 3. Reduce the heat to medium and add the cooked chicken, bacon, peas and corn. Mix and cook uncovered for 15 minutes. Taste and adjust with salt and white pepper if needed. Keep the filling warm or make this ahead of time and reheat when you are ready to serve. 1. Beat the eggs and milk in a bowl with a hand held or motorized blender until you see lots of little bubbles. Let this batter rest for at least 30 minutes in the refrigerator, keeping it very cold until the fat in the oven is smoking! 3. 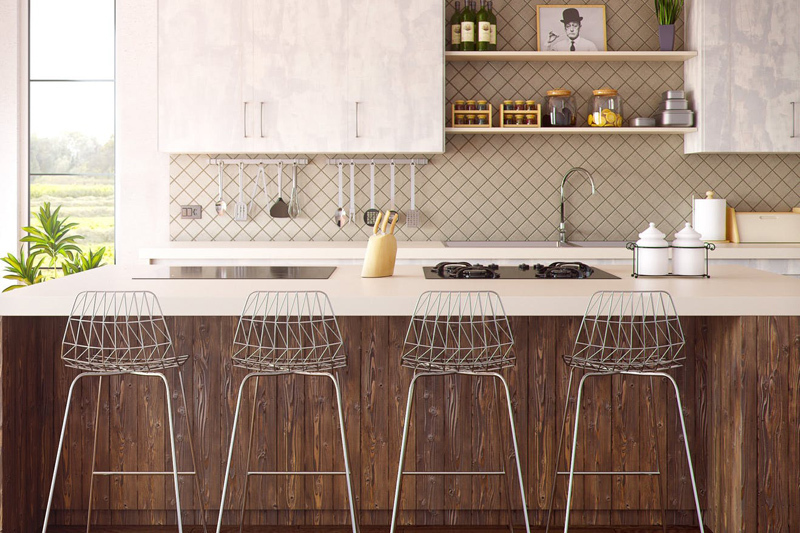 Place a pea sized (1/4 tsp.) of fat is required for the 12 cup muffin pan. So, adjust the fat if you are going to use a muffin top pan or a larger baking dish as I used in the picture. The fat just needs to coat the bottom of the vessel. Place this in the preheated oven until it's really smoky (approximately 15 minutes.) Pour the batter into the tins to come three quarters of the way up. It should sizzle when you pour. Cook for approximately 20 minutes until puffy and golden brown. Never peek at your puddings or they will go flat! 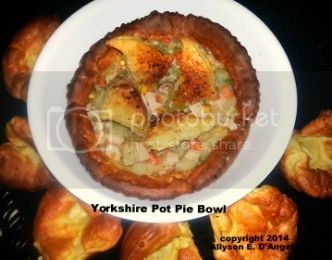 To Serve: Place your Yorkshire pudding/s in a bowl and ladle approximately one to one and a half cups of filling into them. Garnish with flaky puff pastry croutons. I have given you 2 options in the pictures above – small Yorkshires or one giant Yorkshire. The larger pudding I baked in a small pie plate (6” diameter approximately,) and it came out beautiful.